2013. 7x7x1'. 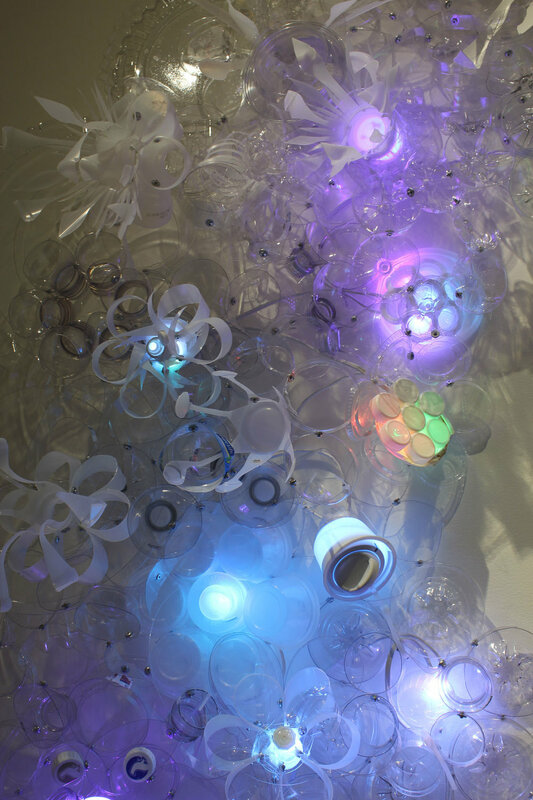 found plastics, RGB LEDs cycling out of phase, slowly and continually changing colors in mostly soft hues. Working with trash grew out of my fascination and concern with our relationships to our ecologies. Plastics come to us the ‘consumers’ as manufactured elegant sculptural objects - artifacts of our exploitive, and exorbitant consumption of resources. They are slick in many senses (made from oil they resist being glued), designed to be appealing and easy to use, light and flexible, smooth and glossy, ‘disposable’ yet beautiful. 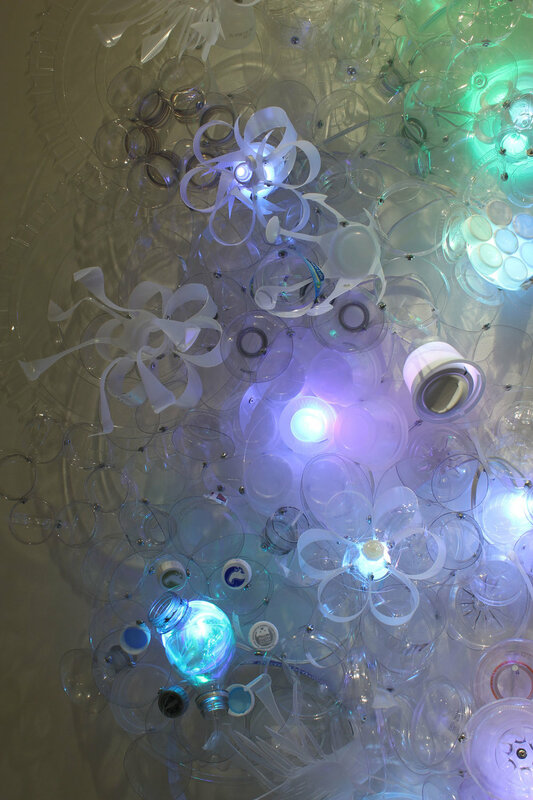 My unease about where plastics are originating from, ending up, and what effects are rippling out along the way led me to make a ‘clear’ sculpture that aims to reflect and illuminate these stories to mesmerize us into action that precludes consumption. My investigations developed into sculptural metaphors that are at once both hopeful and grim, ironic and sincere, a celebration of beauty and a fear of our ecstatic consumption. Reflected in the work are my inspiration sources. Plankton (from the Greek word for drifter, wanderer) – the base of the food chain, and producer of almost 50% of the world’s oxygen (in some parts of our oceans plankton are outnumbered by tiny bits of plastic 60 to 1 and mistaken as food by ocean dwellers), flowers, Fibonacci spirals, cells – both healthy and mutunous, the hexagonal shape of endocrine disrupting molecules, a portal, greenhouse, water, amniotic fluid, babies and mourning the future we are gestating and birthing. 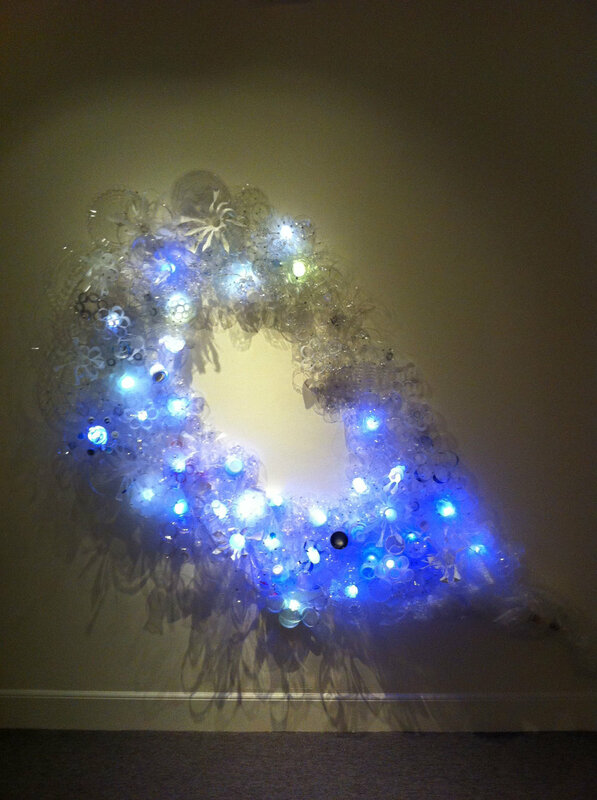 Also inspiring and visible are ice crystals, snowflakes, northern lights, spider webs, clouds, the world upside-down, the light of dawn and hopefully – the creative act of hope and transformation.